The latest development in ultrathin electronics has been making the rounds today on the science blogs, and described in greatest detail here at Science Mag. 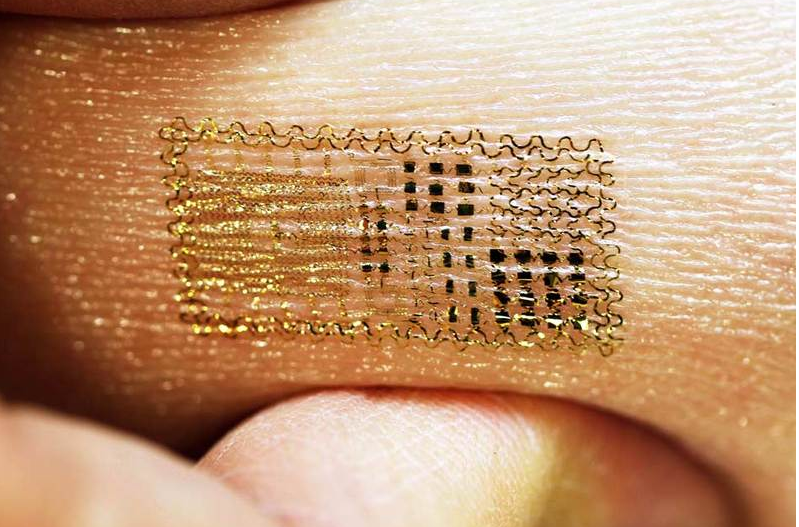 The new technology is known as “epidermal electronics” and can be applied to your skin just like a temporary tattoo. This is a huge breakthrough. It makes me jealous to be living now and not 20 years from now. To have electronics as flexible as human skin will augment robotics, biometrics and health care. Forget your iPhone, one day in the future, you’ll have a super computer tattooed to your wrist. The material is called elastomer, which mimics the mass, thickness, and elasticity of human’s skin. It’s described as “extra-clingy plastic wrap”, which “sticks to the skin naturally, using only the weak, short-range, attractive forces that always exist between neighboring molecules for adhesion.” And it can stay attached for over 24 hours almost anywhere on the human body. Science Mag writes that the devices can even be hidden under actual temporary tattoos to keep the electronics concealed. James Bond would be so jealous! Check out the video here.